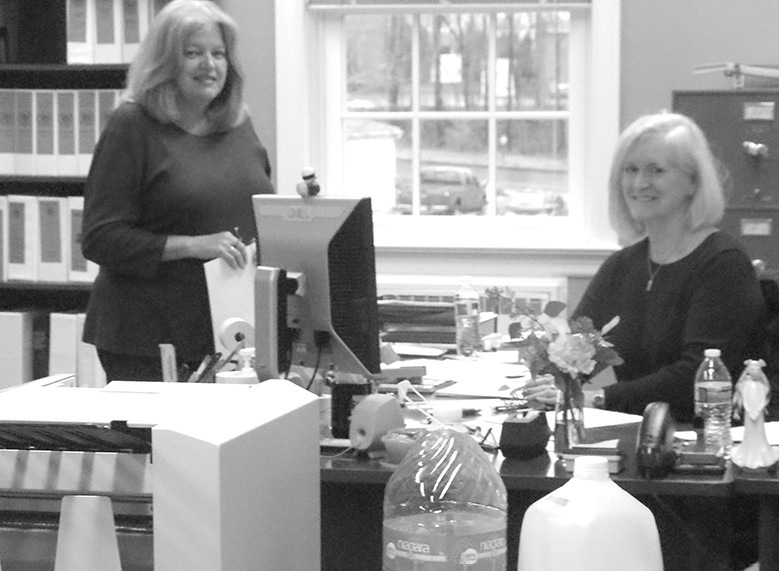 Finance Director Debbie Cerrato, left, and Accounting Assistant Marie Bourque smile happily shortly before Christmas, having returned from 230C Mountain Road in early December to their freshly refurbished old digs on the second floor of the Town Hall. In early December, Finance Director Debbie Cerrato and her staff moved back to the Town Hall from their temporary quarters at 230 Mountain Road, the commercial office building that has been the home of several Town departments in anticipation that the old Town Hall would soon have to be emptied for renovation or demolition. The Finance staff were not the only returnees; the First Selectman and her staff, along with the Human Resources staff, had returned previously. They join the Town Clerk, Tax, and Assessor departments, which had never left. First Selectman Melissa Mack had realized that the big plans for a renovated or new town hall were not likely to proceed immediately, and the rental expense of the temporary quarters was being wasted. The return migration was facilitated by the efforts of the low security State prisoners who regularly work with the Highway Department. Mack reports that they did a great job cleaning, painting, and carpeting, as well as moving furniture. They even polished the brass on the main stairway’s railing. So now what is to happen? It is generally understood that the infrastructure of the Town Hall is 55 years old and in drastic need of replacement. And computers have changed many office practices. There seems little disagreement that the status cannot remain unchanged. As readers of the Observer will recall, these pages have reported extensive efforts to define and price various ways to proceed, including several preliminary concepts for renovating and expanding the old building. Two configurations of totally new construction were also conceived. These possibilities were estimated to cost as much as twice the $5.1 million bonding for the Town Hall voted by the Town in 2015. At the Permanent Building Commission meeting on November 26, Chairman Joe Sangiovanni and First Selectman Mack made it clear that the plans must include no expansion except for the Town Clerk’s vault, which is far smaller than the State demands. The building is thought to have enough space for everyone except Public Works, the Town Engineer, and the Building Inspector. Departments like Police, Fire, and the Highway Garage understandably have separate facilities. There was some feeling that this plan could be accomplished within the $5.1 Million. At the Selectmen’s meeting on December 12 and the Board of Finance on December 17, Mack reported that Attorney Derick Donnelly and Public Works (apparently Facilities Manager Julie Oakes shortly before she resigned) were preparing a Request for Proposal (RFP) for a Construction-Manager-at-Risk proposal for a design-build project for a renovated building expanded only for the vault, at a guaranteed price hopefully within the approved $5.1 million. At the January 9 Selectmen’s meeting, Mack said that the RFP would likely be published later in January. In the meantime, it is expected that when work on the library is complete and library operations return to “the Big House,” Some of the remaining Town offices at 230 Mountain Road will move to the library’s temporary quarters on Ffyler Place.